„At 1 o’clock in the afternoon the Annual Christmas party started. The emcees Ms. Angelita Jalac and Mr. Aaron Limmuel Luces called the attention of the participants for the opening prayer led by Mrs. Jennifer Escuto. After that is the national anthem to the beat of Ms. Esnicky Macaraig. Followed by a presentation from the from silangan elementry pupils. Then a welcome remarks from Mrs. Fedela Bangalisan the parent president of Alouette in Isla Verde. She thanked all the guests and participants and welcome them to the Annual Christmas Gathering 2017. She encouraged everyone to enjoy the day and to continue being an active member of the Foundation as they face another new year as family together. Christmas message was delivered by the area coordinator Mr. Ace Paul Lupingay in behalf of Alouette Foundation. He greeted them a merry Christmas and prosperous New Year. Another dance presentation from kanluran elementary pupil has shown, followed by a presentation from parents and students of kanluran, and from the parents of silangan. After the presentations from parents and students they proceeded to the games. After the games they proceeded to the giving exchange gift. The students happily give and accept their gifts. Then the worker called the parents to give their gifts from the Foundation. After that the worker also called the students and gave their gifts from the Foundation. Both the parents and students were so happy. The worker also gave a token of appreciation to Nanay Marites Enriques for her outstanding dedication in supporting the work of the Foundation in the area. The worker also gave a token of appreciation to Mrs. Fedela Bangalisan for being a responsible parent president. 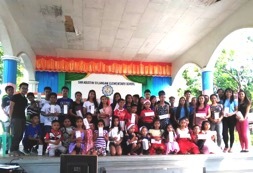 He also gave Mrs. Jolly Luces the principal of San Agustin Silangan Elementary School and Mrs. Kristine Joy Amul elementary teacher for being a good partner and for the not stop support to the Foundation. The area coordinator closed the program by encouraging everyone not to neglect the true meaning of Christmas. That at the end of the day have time to tahnk God for all the blessing you had this year and for another years to come“.